When I was a child, my mother grew strawberries in old car tires in the back garden. They weren't the biggest strawberries, nor were they the perfectly conical clones of each other like the ones lining the market shelves these days. But I can assure you that they were the sweetest, juiciest, purest strawberries I've ever tasted. I remember finding just the right berry, still pale and green, and watching it grow with great anticipation. As the days went by it ripened, the rosy colour spreading from the stem downward. I'd watch and wait, until one morning when I knew the strawberry would be just right. I rushed outside only to find that my precious strawberry had be taken by a hungry bird or squirrel. My brother and I learned to rise early, to creep outside as the sun was just cresting the hill behind the house. The berries were still wet with dew as we gathered them into our sandbox buckets. We had to work quickly before the warm light of the sun fell across their ruby faces and alerted the greedy birds to their presence. Is there any better lesson in patience for a child than to grow strawberries? 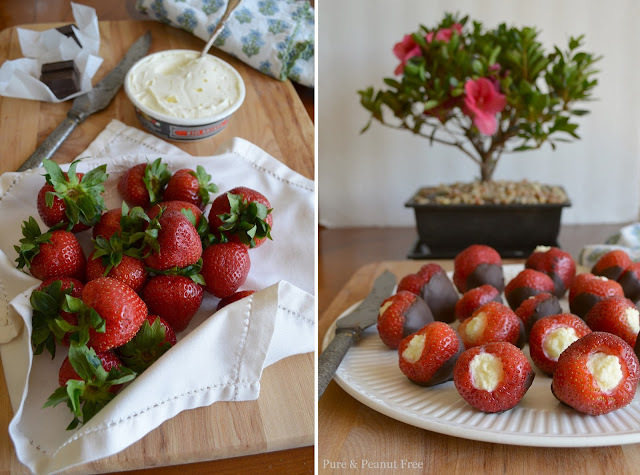 These days my kids swoon over those chocolate dipped strawberries in the supermarket, and invariably someone will bring them to a school function. They know they can't have them, as they're not safe for those with nut allergies, and they try not to act disappointed, but I know they are. So I decided to make something extra special to celebrate the end of the school year. 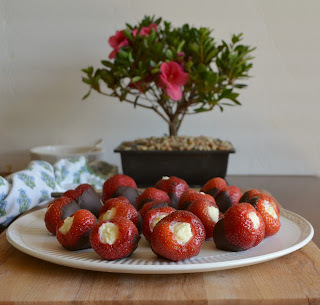 Not only did I dip the strawberries in peanut-free chocolate, but I filled them with sweet and tangy Mascarpone cheese. As they were sitting down for dessert, I heard my kids erupt into silly giggles. I stepped a little closer to hear them reciting the lines to one of their favourite stories . . .
. . . There's only one way in the whole wide world to save a red, ripe strawberry from the big, hungry bear! And we'll both eat it all up. YUM! Now that's one red, ripe strawberry the big hungry bear will never get! Wash and dry the strawberries. With a small pairing knife, carefully cut around the leafy tops and remove. Hollow out as much of the white hull inside as you can without making the walls too thin. Whisk (or beat with an electric hand mixer) the cheese and sugar until fluffy. Don't over mix or the cheese will become grainy. Place the frosting in a heavy zippered bag, and squeeze the mixture into one corner. With scissors, snip off a very small piece of the corner of the bag. Used a paper towel to absorb any accumulated liquid from the inside of the strawberry. 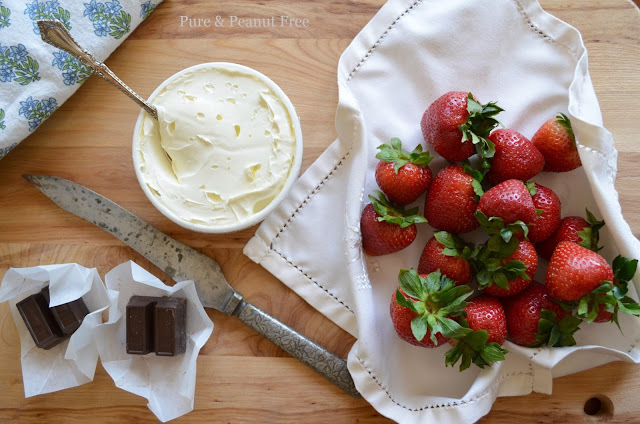 Using the bag, fill each strawberry with the mascarpone frosting and place on a baking sheet. Place the strawberries in the refrigerator for an hour to chill. Chop the chocolate and place half of it in a small glass bowl. Microwave on high, in increments of thirty seconds, stirring in between, until the chocolate is melted. (Depending on your microwave, the total time will be about 1.5 minutes) (Alternately, the chocolate can be melted in a glass bowl set atop a pan of simmering water - stir continuously until melted.) Place the remaining chocolate in the bowl and stir until all the chocolate is melted and glossy. (By adding the un-melted chocolate to the melted you're tempering the chocolate, which keeps it from turning ashy in the refrigerator.) Using paper towels, blot off any water that may have condensed on the outside of each strawberry while in the refrigerator. 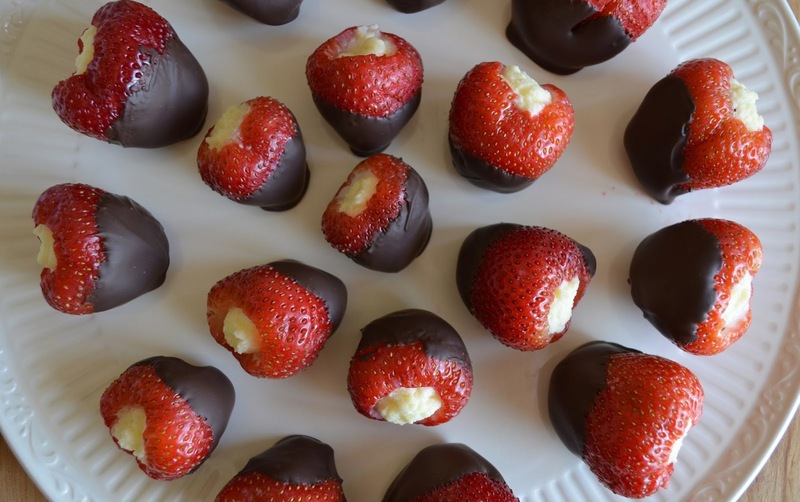 Then dip each strawberry in the melted chocolate, and place back on the baking sheet. Place the dipped strawberries back in the refrigerator until the chocolate solidifies. Keep chilled until ready to serve. We all love chocolate dipped starwberies, but to fill them with mascapone cheese is really decadent. Thank you for the lovely story and delicious recipe.